Thanks to @rearick on the forum for providing this great Starter Guide for Heroes of Steel! This is just the basics from one point of view. For every point in this article there are a dozen posts in the Trese Brothers forum that explore the whys and mechanics and even offer different points of view. Also, I’m mostly going to focus what I consider the strategy of the game: building your team. The tactics of each battle will consistently put your strategy to the test as you move through the game. These are points that I wish I’d known starting out in this game. The Team: Any group of four heroes can be wildly effective. There are certainly trade-offs in picking one character over another but everything is well-balanced as it is. Another corollary to this is that the DLC characters (mobile only) aren’t necessary but I would recommend them just to have the full range of strategy in this game. Combat System: You don’t have to fully understand what’s going on behind the scenes with the combat to enjoy this game. For the basics, it’s enough to know that it’s based on dice and increasing your abilities allows you to stack the rolls in your favor. The monsters are also increasing, however, and since it is based on dice, it is possible to have wild runs of luck in both directions. You’ve been warned. Focus: As with many games in this genre, it pays to specialize. The first time you get an opportunity to upgrade your talents after your escape, you may well be overwhelmed by the number of choices. Resist the urge to take a little bit of everything, this just waters down your heroes and they end up not being able to keep up with enemy progression. As you’re just figuring out the game, pick about three talents that you want to try and invest in those. Buffs: These can be cast before combat and probably should be unless you’re in a unique situation like pressing through multiple combats on the way to an inn and just don’t have the SP after the first couple of engagements. Equipment: Initially these items are nothing to write home about and it feels like a very slow burn between times you actually find something legitimately useful. Later on in the game, however, you’ll have more equipment than you could ever want. It will also become the best way to either cover gaps in your heroes’ development or stack up bonuses that make them more powerful than you can possibly imagine as you escape from the dungeon at Red Hill. The Team: Let’s talk about roles. These are things that your heroes can be doing on your team. Not every team needs every role filled, but if you don’t a role definitely take advantage of your ability to deepen the specialization of another role. Tank – absorbs attacks from a massive number of enemies either through actually taking the hit or dodging it. Off-tank – In Episode 1 you can get by with just one tank, but as the game progresses all of your heroes will need some level of survivability and you will certainly need one hero to stand in the gap to take the hits your main tank just can’t absorb through sheer numbers or positioning. Healer – self-explanatory, but think through whether you need single target or area of effect healing with your build. Sniper – sometimes there’s one monster that just has to die for you to make it through without a death. It’s so helpful to have a hero who can reliably deliver a lot of damage exactly where you need it. 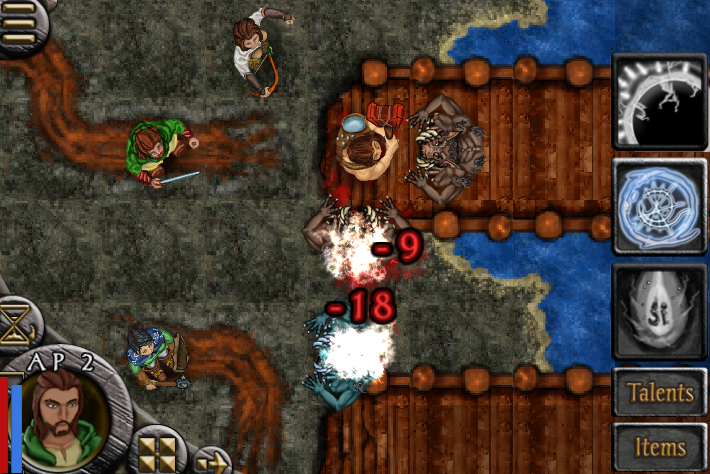 AoE damage – Area of Effect damage. One action and a whole lot of pain, what’s not to like? Not strictly necessary early on but makes mid game much easier and a lot more fun. Buff/Curse support – This is where the real synergy of a team comes from. If you’re not taking advantage of team buffs or curses that help your team survive and take out the enemy, you’re not really experiencing this game. Combat System: If you’re someone who wants to build the most effective party you can really get into the nitty gritty of this game both through the forums (link) and the info screens provided in-game. Here I’ll just mention that it’s helpful to be able to be very AP efficient in your builds. For example, if you have a 4 AP spear and get to take one swing in a round but then you don’t have anything useful for the other 3 AP, you’re really missing something. Explore different talents that you will use often that end up equally 7. Or make sure you stay mobile enough to move around to make your actions efficient. Focus: After you begin to get your feet under you, you may (like I did) want to start a new group with what you now know. I’d highly recommend visiting the forums to think through what upper level talents you want to move towards and go into your group with a plan (link to John Robinson’s tables). It can be easy to get distracted from that plan at each leveling opportunity, but stick with it and you’ll get to where you really want to be sooner and with fewer extra level one talents. Buffs: Don’t underestimate the power of increasing a buff’s duration with its associated skill (lore, leadership, conjuring, etc.) This will help you get through multiple small fights on a single buff saving on SP and give you a great advantage in the longer fights. You can keep hitting the enemy without having to take time to rebuff in the middle of a fight or suffer the effects of carrying on un-buffed. Transitions: Your heroes start very far away from where they will end up. As you have a plan, don’t feel like you have to jump into it right away. Some of your heroes will need a good bit of coddling before they are ready to fully take on the role you have in mind for them. Be willing to have some of your team pick up the slack as you continue to get ready. A great example would be developing your Paladin as your main tank. She needs the proper development of attributes, skills, talents and armor to step into her own and it takes a lot of leveling. Stay the course, though, and it’ll be worth it.